Four years ago actress, model and musician, Judita Wignall, was experiencing health challenges that forced her to reevaluate her diet and lifestyle. She discovered the raw food diet and was so inspired by the positive effects on her life that she then became a certified raw food chef and instructor. Her book, Going Raw, offers an introduction to the practical aspects of eating a raw food diet such as setting up your kitchen and raw food preparation techniques. It also includes an extensive selection of raw recipes for every meal of the day. Wignall starts by explaining the benefits of raw foods including their energizing and immune boosting properties. She then goes on to outline “raw basics” such as stocking your pantry, basic knife skills and helpful kitchen equipment. The main portion of the book is devoted to healthy recipes including smoothies, juices, breakfast, salads and dressings, soups and sides, entrees, desserts, snacks, beverages, living and fermented foods. Also included is a section for “quick and easy bites”. She discusses how to decide how much raw is right for you and emphasizes that when you start eating raw you shouldn’t regard eating cooked food as a sin or as cheating, but as a choice. You should listen to your body and take note of how you feel after eating certain foods to work out what is best for you. Although she has included many decadent recipes in the book she says “please don’t eat brownies and ice cream all day long and declare that you are raw”. Instead you should focus on eating plenty of greens, veggies and fruit first, then splurge on the other stuff when you need to. She also offers readers practical and easy raw tips and tricks for advance food preparation and basic meal planning advice. Also included is a sample seven-day menu and suggestions on how to eat in restaurants and other social situations. Raw fruits, raw vegetables, sprouts, sea vegetables, flaxseeds, hemp seeds, sunflower seeds, chia seeds, raw cashews, almonds, walnuts, tahini, buckwheat, oats, wild rice, avocado, coconut, kelp noodles, tamari, miso, agave, raw honey, raw cacao, vanilla. Going Raw does not include exercise recommendations, but Wignall briefly mentions the benefits of physical activities such as walking, hiking, yoga, rebounding, bike riding, and running because they release feel-good endorphins. 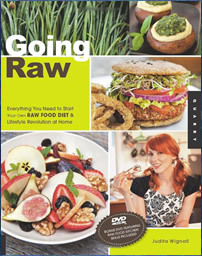 Going Raw: Everything You Need to Start Your Own Raw Food Diet & Lifestyle Revolution at Home retails at $24.99. Encourages a high intake of fresh fruit and vegetables, sprouted whole grains and raw nuts and seeds. Provides a wide variety of raw food recipes. Includes color photographs and step-by-step instruction guides for the recipes. Offers advice about eating out and being social on a raw food diet. Many of the recipes involve a lot of time and require advance preparation such as soaking and sprouting. Some of the recipes, especially desserts, are high in fat and sugar. Not designed specifically as a weight loss diet. May be difficult to eat out and stick with the diet. Many of the recipes may require the purchase of additional equipment including a blender or food dehydrator. Going Raw is a practical guide to getting started with eating raw and setting up a raw food kitchen. It includes a wide variety of raw food recipes and offers advice on many aspects of the raw food lifestyle including eating out, meal planning and creating a nutritionally balanced diet.